Yes! 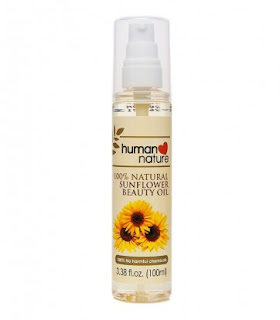 It's a gold elixir... it's the Human Nature Sunflower Beauty Oil! It's 100% Natural and packed with vitamins A, D and E that help moisturize and nourish your skin to give it that healthy glow -- without any harmful chemicals. It’s so effective and so versatile, the uses are endless! No wonder sunflowers are known as "happy flowers" for the joy they bring. Hope you try the Human Nature Sunflower Beauty Oil and experience the miracles and happiness it has brought me for the past year. I have been using it mainly for my hair, face and body... ooppss that means anywhere. Was so glad that it now comes in a big 100ml bottle and not just the small pocket size 50ml bottle. Human Nature products are now available at KabayanCentral.com.